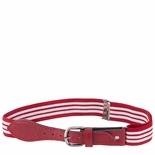 Hard to find, ever popular colored belts. One size fits all. Adjustment fit. A great do-it-yourself belt for toddlers. The belts are 7/8 in. wide. All the belts have a leather brass buckle. Dapper Snappers are great adjustable short belts. 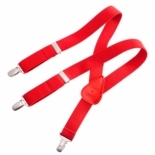 This toddler belt consists of a short piece of suspender elastic with snaps that fits in the back 3 belt loops of children's pants (recommended ages 9 mo-5 yrs - one size fits all) and snaps over the outer 2 loops to cinch the pants thereby keeping them from falling down. Perfect for infants and babies! Check out our kids suspenders, whether it's to hold up their baggy pants, or simply to give them an extra cute and stylish appearance. 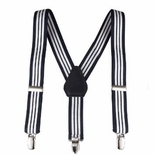 These quality and well-priced suspenders feature nickel easy to attach clips and a "single-piece" back style. Girls just love to dress up, these belts would do it!